Germany says uncertain where 130,000 registered migrants are? 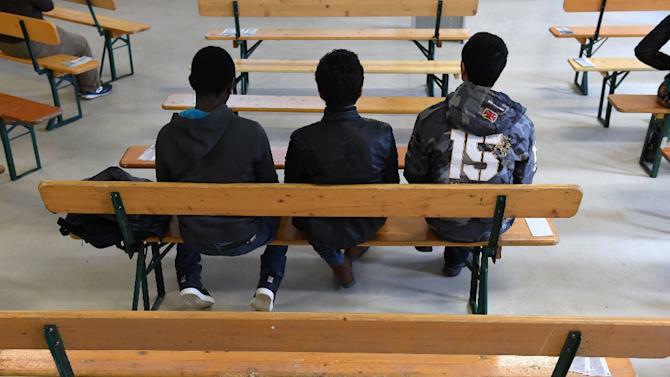 Berlin (AFP) – German authorities do not know the whereabouts of 130,000 asylum seekers, the government said in a parliamentary document seen by AFP on Friday. Out of some 1.1 million asylum seekers registered in 2015, “about 13 percent did not turn up at the reception centres to which they had been directed,” the government said in a written reply to a question from a lawmaker of the Left Party. Some may have returned to their home countries, travelled on to another country, or gone underground, it said, adding that there may also have been repeated registrations of the same individual. A spokesman for the interior ministry said a package of new measures approved by parliament on Thursday is expected to help address the problem. These include plans for an identity document to be issued upon the arrival of a migrant, which would allow authorities to store personal data under a common database and thereby help to avoid repeated registrations. The new rules, which includes restricting family reunions for some migrants, also lower the hurdles for the expulsion of convicted foreigners — a key measure proposed after the New Year’s rampage in Cologne, where hundreds of women reported being sexually assaulted and robbed in a crowd of mostly migrant men. About 13 percent of all refugees who have officially entered Germany in 2015 have gone missing. Germany has officially welcomed as many as 1.1 refugees into their country and they suspect that over 400 thousand are undocumented and untraceable. Germany has tried to send them back to their host countries, but so far has been largely unsuccessful. This poses a huge risk for all of Europe, both from a terrorist standpoint and an economic one. According to Frank-Jürgen Weise, the head of Germany’s Federal Office for Migration (BAMF), there are as many as 400,000 asylum seekers within the country who have no ID documents and German authorities have proven unable to identify them, the head of the BAMF agency said in Berlin on Thursday. Grassroots rebellion: No Syrian refugees here! To see more than 500 people at a government meeting usually means one of two things – a major tax hike is on the agenda or something akin to a nuclear waste dump is being proposed. So what was it that had the townspeople of rural Ravalli County, Montana, so stirred up? The answer is simple: Syrian refugees. The county held a public hearing Feb. 18 on a proposed letter to be sent to the Obama administration, Montana Gov. Steve Bullock and the state’s congressional delegation making one point abundantly clear – no Syrian refugees will be welcomed in Ravalli County. The county commissioners voted unanimously to send the letter. Many people who could not make it to the meeting had called or wrote their commissioners. Commission Chairman Ray Hawk said the content of those calls and letters was 50-to-1 in opposition to allowing refugees to be resettled in Ravalli County, the Missoulian reported. A few people spoke in favor of welcoming refugees to Ravalli saying they were embarrassed by the tone of the meeting. They were booed and heckled, the newspaper reported. The pushback was sparked by an announcement recently by two nonprofits – Soft Landing Montana and WorldMontana – that they plan to work with the federal government to bring Syrian refugees to Big Sky Country. The plan is to resettle the Syrians in the Helena area and in Missoula County, a neighboring county to the north of Ravalli County. As WND reported last month, the Obama administration is increasingly sending Muslim refugees to smaller cities in Middle America. Wyoming and Montana are the two exceptions. Wyoming is the only state that does not participate in the federal refugee program. Montana has not received any refugees since 2009 and only 61 have been sent there since the Sept. 11, 2001, terrorist attacks. It was against that backdrop that Thursday’s public hearing in Ravalli County was held. Interest was so high that the meeting had been moved three times to accommodate the ever-growing crowd. It was eventually decided to hold the meeting in the gymnasium of a local junior high school. The crowd erupted in a standing ovation when the unanimous vote came down in favor of sending the letter. Caroline Solomon, who lives in Flathead County near Kalispell, in northwestern Montana, is a member of the Montana chapter of ACT for America, a group that educates the public about the dangers of creeping Islamic supremacism in Western cultures. What happened in Ravalli County was huge, she said. Pamela Geller wrote the book on grassroots activism, offering proven, practical guidance on how freedom-lovers can stop jihadist initiatives in their local communities in her blockbuster “Stop the Islamization of America,” available in the WND Superstore. The same trend of people “waking up” is also seen in the growing crowds coming to Act for America meetings, Solomon said. Paul Nachman, a retired physicist and immigration expert from Bozeman, will speak about refugee resettlement at the next meeting of Act for America on Tuesday. Montana and Wyoming the last frontier? “We had to move it to a bigger location. I think people are waking up and realizing that Wyoming and Montana, we’re the only ones still standing (against the refugee influx),” Solomon said. Neighboring Idaho has become a hotspot for refugees in recent years, taking in nearly 11,000 since the Sept. 11, 2001 terror attacks. Even Alaska has been sent 1,130 refugees, including more than 500 from Muslim countries, over that same period, according to U.S. government data. Montana Gov. Steve Bullock, a Democrat, has supported President Obama’s plans to bring in 10,000 Syrians and 85,000 refugees from all countries this year, followed by 100,000 in fiscal 2017. 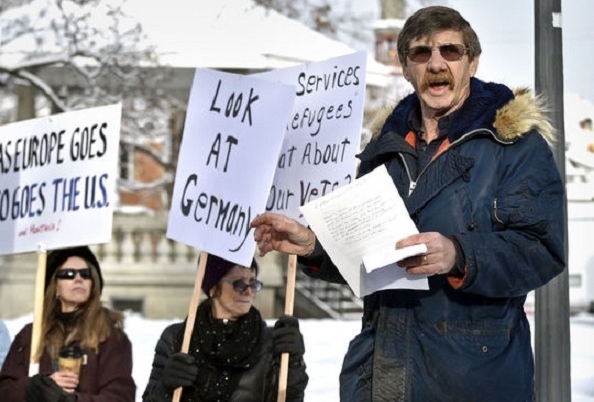 According to a NBC-13 News poll conducted Feb. 18, 93 percent of Montanans who participated said they were against resettling any Syrian refugees in Montana. And the opposition is only growing as people learn about the refugee program, Solomon told WND. Those who spoke at the Ravalli County meeting were not in a mood for compromise. Hollis Poe of Hamilton told the commission he was starting a new group called Advancing Conservatism. Phil Liggins, also of Hamilton, said Allah and the God of the Bible were not the same. “The U.S. may not be at war with Islam, but Islam is at war with the U.S.,” he said. Commissioner Jeff Burrows said, in the end, the decision came down to economics. ‘Pockets of resistance’ forming across U.S.
Ann Corcoran, who has been following refugee resettlement for nine years as a blogger at Refugee Resettlement Watch, said she has never seen so much interest in the issue as she is seeing now. “Pockets of resistance” are popping up across the country, fueled by news of terror attacks by Muslim refugees in Paris, France, in November and by a husband and wife duo in San Bernardino in December. The wife in the latter attack, Tashfeen Malik, came to the U.S. as an immigrant on a fiancée visa from Saudi Arabia. The visa screening system failed, just as the refugee screening system has allowed dozens of terrorists into the country from Somalia, Iraq, Uzbekistan and Bosnia, Corcoran said. More than 30 refugees from Somalia alone have left the country since 2007 to fight for overseas terror organizations, the FBI reports. And FBI Director James Comey said in congressional testimony last October it was impossible to screen the vast majority of Syrian refugees because the U.S. has no access to reliable law enforcement data in that war-torn country. After the Paris attacks, more than two dozen governors wrote the Obama administration and requested that no Syrians be sent to their states until they can be properly vetted. The administration ignored those requests and the Syrians continue to arrive daily in dozens of U.S. cities and towns. Just since Nov. 1 of last year, the Obama administration has delivered 721 Syrian refugees to the U.S., according to the federal refugee database. That boosts to 2,761 the number of Syrians who have been sent to the U.S. since the outbreak of that country’s civil war almost five years ago. That was borne out last September in comments by Larry Bartlett, a State Department official, while speaking in Twin Falls, Idaho. Bartlett said in that meeting that the feds don’t send refugees to places where they could be “unsafe,” which Corcoran described as a “slap in the face” by a cynical government bureaucrat who would insinuate that because a community didn’t want Muslim refugees that they would actually hurt them physically. Here we go again. As you slept comfortably in your bed last night there was another terrorist attack on U.S. soil. There is a total media blackout and no buzz on twitter, but a Somali man, Mohamed Barry, is a suspect in a machete attack on a restaurant in Columbus, Ohio. The Nazareth Restaurant is owned by an Israeli Christian so it’s not a surprise that it would be a target for jihad. Four people were hospitalized, one with critical injuries. Patrick Poole of PJ Media has more details. CBS News has identified the suspect as Mohammad Barry, however neither 10TV nor Columbus Police have confirmed the suspect’s name. CBS News also reports Barry has a Somali background and may have traveled to Dubai in 2012. As always, the FBI has declined to release the man’s immigration history. Senators Sessions and Cruz have already identified 113 Muslims involved in attempted terror plots on American soil and have demanded information on their immigration history. The Obama administration has thus far refused to cooperate. It’s important to note that while everyone is focusing solely on Syrian refugees, we’ve actually had more problems from Somali Muslim immigrants. We’ve taken in over 130,000 refugees from Somalia since 1993 and Columbus likely has the second largest population of these refugees (behind Minneapolis). Even to the extent Republicans want to discuss the problem with refugees, they engage in political correctness in limiting the problem to Syria, as if it’s a problem limited to “ISIS infiltrators,” not a problem with the Islamic supremacist ideology endemic of many Muslims from numerous other countries as well. The other important detail here is that the suspect allegedly traveled to volatile countries over the past few years. Obviously, we have to get the full details in this case, but there is no reason we should not be monitoring such travel more carefully and watching those returning from these countries under suspicious circumstances. Yet, Congress refuses to deal with those who are already known to have travelled to foreign countries to fight with terrorist organizations. Members of the Senate Judiciary Committee are balking at Sen. Cruz’s Expatriate Terrorist Act, which strips citizenship from those convicted of fighting for foreign terror groups. Over the past few years, dozens of Somali refugees have gone over to fight for foreign terror groups, yet Congress did nothing to stop Obama from bringing in another 15,000 refugees from east Africa this year. Unfortunately, until we bring this under control, these attacks will be a regular occurrence. How many more people will have to die before it is socially acceptable among the political elites to place the security of American citizens above their own feigned sanctimony? Members of Iran’s terror proxy Hezbollah “are moving freely” within the United States and Latin America, courtesy of Venezuelan passports issued by a Cuban company hired by Caracas, reports the UK-based Asharq Al-Awsat. The report echoes various articles by Breitbart News, which, among other things, havehighlighted that Hezbollah operatives, including the right-hand man of the head of Hezbollah in Lebanon, are using passports obtained from countries in the Americas, primarily Venezuela and Cuba, to enter the United States. In February 2015, experts at a National Defense University (NDU) conference warned that the narcoterrorist group Hezbollah, based in Lebanon, has expanded across Latin American and into the United States. Breitbart News recently learned that the U.S. State Department is concerned about the illicit activities in the Western Hemisphere of terrorist group Hezbollah. Analysts estimate that Hezbollah generates millions through drug trafficking, money laundering, and other criminal activities in the Americas. “According to these reports, the intelligence services in Canada and Bulgaria have recently spotted the movements of citizens of Arab origin, especially those belonging to Hezbollah as well as Iranian agents carrying original Venezuelan passports in order to move within a number of countries, especially United States, Canada, and South America,” it adds. Anthony Dakin, the former Venezuelan Minister of Interior who currently lives in the United States, has suggested that “Venezuela has become a hub for granting passports for Iranian groups and members of Hezbollah, in order to facilitate their travel,” reports Asharq Al-Awsat. “Antony Dakin told the media that Caracas has contracted with Cuban companies to issue mechanized and biometric passports,” continues the report. Dakin added that Cuba gained access to data of around 80 million citizens when it signed contracts with other countries in Latin America, such as Argentina and Ecuador. “These contracts allow Havana to issue identification papers without forgery and by using other people’s data,” notes Asharq Al-Awsat. Misael López Soto, a Venezuelan diplomat in hiding, has accused Venezuelan President Nicolás Maduro of selling visas, passports, and falsified birth certificates out of the Venezuelan embassy in Baghdad to nearly thousands of Middle East residents, including at least one confirmed Hezbollah terrorist. The book cites witnesses and Venezuelan diplomatic cables as sources of the information it contains. After Maduro met the Hezbollah chief, at least 300 Hezbollah operatives were reportedly able to secure Venezuelan passports, which made potential entry into Canada and the United States much easier, according to the book and Argentine website Infobae. 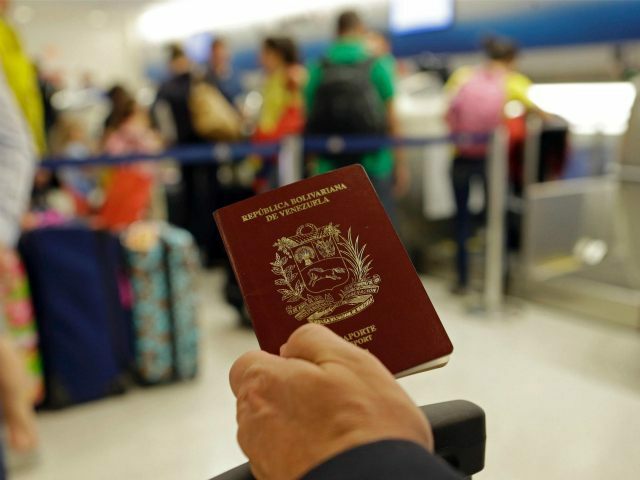 Venezuela and its strongest ally, Cuba, have both been accused of issuing falsified Latin American passports to Middle Eastern operatives linked to Hezbollah. 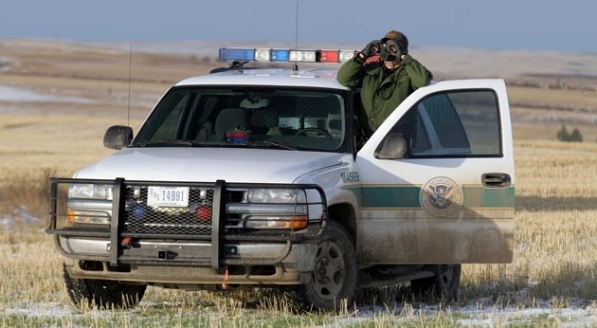 A border patrol agent monitors Canada-U.S. border in Montana, which has 550 miles of largely unprotected border. The border continues along North Dakota, Washington, Idaho, Minnesota, Wisconsin, Michigan, Maine, Ohio, New York and several other states. Canada’s new Liberal prime minister plans to “fast track” the acceptance of thousands of Syrian refugees over the next few weeks and that has some in Congress worried about security at the mostly unpatrolled northern border. Prime Minister Justin Trudeau took office Nov. 4 promising to take in no less than 25,000 Syrian refugees by Dec. 31 and up to 50,000 by the end of 2016. The government fell far short of its goal, admitting only 6,000 as of Dec. 31 and about 15,000 to date, but Trudeau’s administration now says it will meet the 25,000 goal by March 1. Canada and the U.S. share the world’s largest undefended international border. It stretches more than 5,520 miles across 13 states over land and water. The International Peace Garden was opened in 1932 in Bottineau, North Dakota, and the famed Peace Arch in Blaine, Washington, was dedicated in 1921 to celebrate the fact that the two countries share not only miles of border but values based on freedom and democracy. But that was before the Syrian civil war, the Arab Spring, and mass migration of millions of Muslims out of the Middle East and Africa into Europe and North America. Congress spent much of last year debating the merits of President Obama’s plans to bring in 10,000 Syrian refugees. FBI Director James Comey testified on Oct. 1 saying it was virtually impossible to screen the vast majority of people who show up at United Nations’ refugee camps claiming to be Syrians. But in the end House Speaker Paul Ryan and the Republican Congress decided to fully fund the president’s expanded refugee program. Now the Senate Homeland Security Committee is asking questions about Canada’s even more aggressive Syrian refugee program and how it might affect U.S. security. The committee held a hearing Wednesday where it was revealed that the northern border is severely undermanned. Only 300 U.S. border agents are working at the Canadian border at any given time, said Dean Mandel, a U.S. Border Patrol agent assigned to the Buffalo sector. That compares to more than 2,000 agents patrolling the southern border with Mexico at any moment in time. “We have one agent for every linear mile on our southern border and one for every 13.5 miles on our northern border,” Mandel said, adding that the northern border also has far fewer cameras and other technological infrastructure in place. 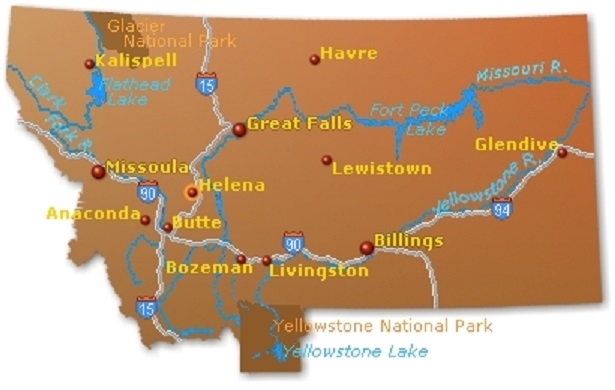 Montana alone has a 550-mile border with Canada, much of it rugged terrain and not monitored. Michigan, New York and Ohio have borders that include vast expanses of water. And now Trudeau’s government plans to expedite the process of screening and integrating tens of thousands of Syrian refugees. “There is a significant controversy over Canada’s plan to accept 25,000 refugees from Syria. Can we meet this risk? Canada is a diverse nation and has a Muslim population three times our own on a per capita basis,” said Mandel, who was testifying on behalf of the National Border Patrol Council. Mandel said the visa waiver agreement the U.S. has with Canada presents a special risk. “The visa waiver system is a huge security gap, because it is based on the assumption that if you are from Canada, a friendly country, you are no security risk,” he said. “And database background checks are only as good as the database itself, which we found out in the San Bernardino (terrorist) case,” he said, referring to the fact that jihadist Tashfeen Malik entered the U.S. by passing through a visa background check. Mandel advised the Senate that manpower be beefed up on the northern border. David Harris, director of INSIGNIS Strategic Research, an international intelligence firm based in Ottawa, also expressed grave concern about the infusion of so many Syrian refugees into Canada over such a short period of time. Sending 25,000 Syrians to Canada would be the equivalent of sending 225,000 to the United States, he said. He also reminded the committee that a Lebanese cabinet minister warned in 2015 that about 2 percent of those seeking refuge in United Nations refugee camps in his country are connected to the Islamic State or ISIS. Sen. Heidi Heitkamp, D-N.D., also represents a state with a vast unpatrolled border. It has been suggested in Canada that the risks can be mitigated by limiting refugee eligibility to children and families “but people lie about their age,” Harris said. Sen. Kelly Ayotte, R-N.H., wasted no time asking what was being done to protect the northern border. Mandel said the Border Patrol is not prepared to meet the challenge. Another issue is how Shariah-compliant Muslims from Syria will treat women, homosexuals and Jews in their adopted Western country. Canada’s elected leaders, like those in the U.S., have stressed that Canada has a history of taking in people seeking refuge from persecution and war. Panelists Wednesday pointed to the Vietnamese boat people and the flight of Jews out of Europe following World War II. “But the boat people were brought in over a period of a decade, so that presents a significant difference,” Harris said. Laura Dawson, who directs the Canada Institute at the Woodrow Wilson International Center for Scholars and once worked in the resettlement industry with her church, said the word “expedited” is not the proper term to describe the fast-tracked Canadian refugee acceptance program. “I would say ‘enhanced’ or ‘expanded’ are better ways to describe it,” she said. But Guidy Mamann, a senior partner at the security firm of Mamann, Sanddaluk & Kingwell in Toronto, bristled at that notion. Harris cited a study by the Center for Immigration Studies, previously reported by WND, which found that the U.S. could help 12 Syrian refugees in the Middle East for what it costs to permanently resettle one in America. Mamann said the challenges of permanently resettling 50,000 Syrians in Canada cannot be overstated. “This is not a rescue mission this is a resettlement program. They’re already in camps where the U.N. is protecting them from danger,” he said, adding that the pressure on security personnel to complete the screening process by the target date is enormous. The 50,000 Syrians who will eventually be resettled in Canada will be able to enter U.S. ports of entry without a visa – meaning no background checks are required – within four years of their arrival in Canada, Mamann said. Syria is widely considered to be a hotbed of terrorist activity, he said, which cannot be glossed over. They come to Canada or the U.S. because they are assigned to those countries by the United Nations High Commissioner for Refugees, not because it was their choice, Mamann said. “Whether they adopt our values is something that will be determined over time and we have no way of knowing,” he continued. He said Canada has deployed 500 immigration agents to the Middle East to start screening refugees. Canada requires citizens to privately sponsor each refugee, which many on the Senate panel agreed is a better system than the U.S. employs for making sure the new arrivals get assimilated into their adopted homeland. But so far only 10,000 of the 25,000 will get these private sponsors because not enough Canadians have volunteered to sponsor Syrian families. Sen. Jon Tester, D-Mont., asked how many border agents Canada deploys at any given time along its border with the U.S.
“I would suspect it’s a lot less than that, less than 300,” Harris said. And as for response times? “Canada, their reaction time is good but it could be better. Sometimes the time can be…” Mandel said, shaking his head. Tester also asked about visa waivers. Mandel says the system lacks comprehensiveness. “If they’ve overstayed their visa and they’re doing something nefarious, it doesn’t alert me. So a lack of comprehensiveness from our side is a concern,” he said. “How do we know the wife is really the wife and the kids are really the kids in case there are no records?” Tester asked. Dawson, the former refugee resettler, said that isn’t a major concern. Mamann said the 6,000 Syrians who entered Canada by Dec. 31 were “the easy cases” because they were already in the U.N. pipeline. “Now the question is the remainder are people who may or may not have been selected and the background checks may not have been started,” he said. Sen. Rob Portman, R-Ohio, asked about potential problems coming across Lake Erie in Ohio. Mandel said it’s much more complicated on the northern border because of the tourist attractions at Niagara Falls and Lake Erie. “If Canada does have a more aggressive refugee program, and is not doing the same level of vetting that the U.S. would do, then that puts us at risk,” he said. Portman said the CIS study about the costs of resettling refugees vs. the costs of helping refugees where they are in the Middle East should be seriously considered. Mamann said only 6 percent of refugees take up the offer to come to Canada. The resettlement of 25,000 Syrians will cost $1.2 billion Canadian dollars. Most terrorists don’t have negative records, he said. “If you look back at 9/11. A person who has a clean record, that’s the person who is going to be a problem,” he said.